A 38 year-old male with no medical history presents to the emergency department with abdominal pain. He had one episode each of non-bloody emesis followed by watery, non-bloody diarrhea and cited several sick contacts at home with similar symptoms. Vital signs were notable for bradycardia with a heart rate ranging from 38-46bpm though he was normotensive. The examination including abdominal examination was benign. A 12-lead electrocardiogram was obtained which demonstrated sinus bradycardia. The patient was asymptomatic during episodes of bradycardia and his heart rate responded appropriately during activity and on further history reported that he was an endurance athlete and runs multiple marathons each year. He was discharged after symptomatic improvement with anti-emetics. Analysis of 277 patients presenting to the emergency department with “compromising” bradycardia. Mangrum JM, DiMarco JP. The evaluation and management of bradycardia. N Engl J Med. 2000;342(10):703-709. doi:10.1056/NEJM200003093421006. Ufberg JW, Clark JS. Bradydysrhythmias and atrioventricular conduction blocks. Emergency Medicine Clinics of NA. 2006;24(1):1–9–v. doi:10.1016/j.emc.2005.08.006. Hayden GE, Brady WJ, Pollack M, Harrigan RA. Electrocardiographic manifestations: diagnosis of atrioventricular block in the Emergency Department. J Emerg Med. 2004;26(1):95-106. doi:10.1016/j.jemermed.2003.10.001. Da Costa D, Brady WJ, Edhouse J. Bradycardias and atrioventricular conduction block. BMJ. 2002;324(7336):535-538. Semelka M, Gera J, Usman S. Sick sinus syndrome: a review. Am Fam Physician. 2013;87(10):691-696. Ewy GA. Sick sinus syndrome: synopsis. J Am Coll Cardiol. 2014;64(6):539-540. doi:10.1016/j.jacc.2014.05.029. Sodeck GH, Domanovits H, Meron G, et al. Compromising bradycardia: management in the emergency department. Resuscitation. 2007;73(1):96-102. doi:10.1016/j.resuscitation.2006.08.006. Deal N. Evaluation and management of bradydysrhythmias in the emergency department. Emergency Medicine Practice. 2013;15(9):1–15–quiz15–6. Demla V, Rohra A. 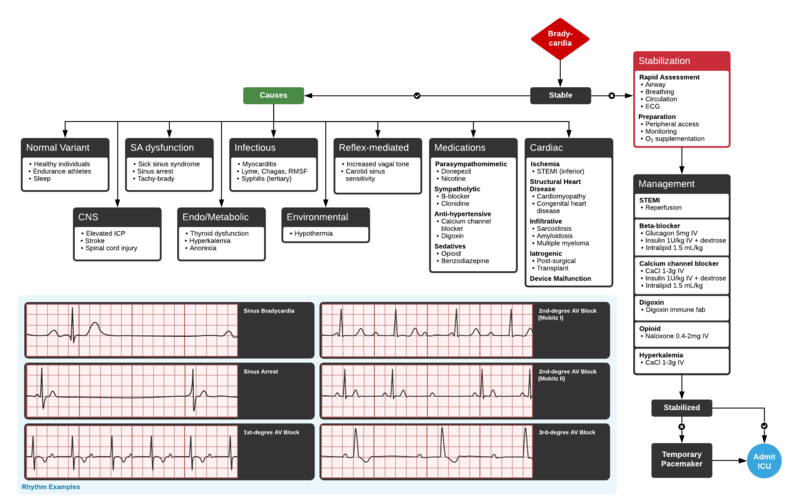 Emergency Department Evaluation and Management of Bradyarrhythmia. Hospital Medicine Clinics. 2015;4(4):526-539. doi:https://doi.org/10.1016/j.ehmc.2015.06.009. Brady WJ, Harrigan RA. Evaluation and management of bradyarrhythmias in the emergency department. Emergency Medicine Clinics of NA. 1998;16(2):361-388.